Yesterday I looked at the fiber content and general appearance of Red Heart Boutique Irresistible yarn. Before I get into the knitty-gritty of Irresistible yarn, I want to go over the several colors you can choose from to suit your mood and decorative needs. You’ll remember from yesterday’s post that I’m knitting this blanket for my daughter, so she got to choose the color that best suits her room. She loves vintage, its colors and collectibles. Irresistible yarn has a good balance of neutrals, brights and variegated colorways. She chose Taupe, and you’ll see in the next couple of posts, how perfectly it matches her room. Whenever I see a color palette, I let my mind wander with possibilities. If I had to choose, I’d choose the Berry, Burgundy…and the variegated colorway, Enchanted. But this isn’t my blanket. Here’s the color palette for Red Heart Boutique Irresistible Yarn. 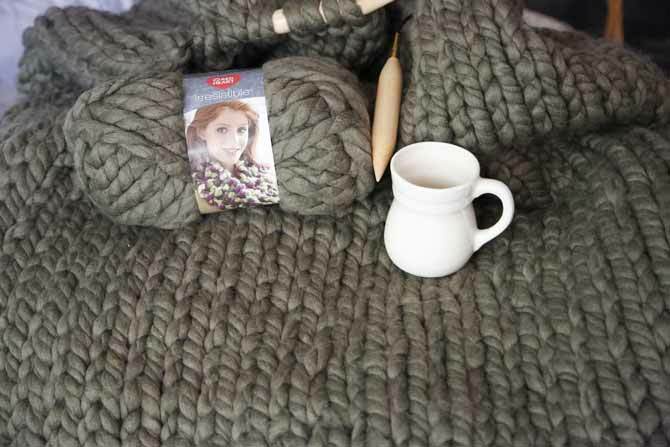 Getting to the knitty-gritty…imagine finishing up a knitting project in a sock weight yarn, and starting a blanket in a jumbo weight yarn. There’s a big difference in the sensation of your hand movements – I say hand and not fingers, because when knitting with jumbo yarn you’ll need your whole hand to maneuver the needles and yarn. I got the groove very easily, and it was almost a relief from the small hand movements of a sock yarn project, in the sense that my entire hands and wrists were moving. Can you relate? Irresistible yarn in Taupe, super quick to knit up. 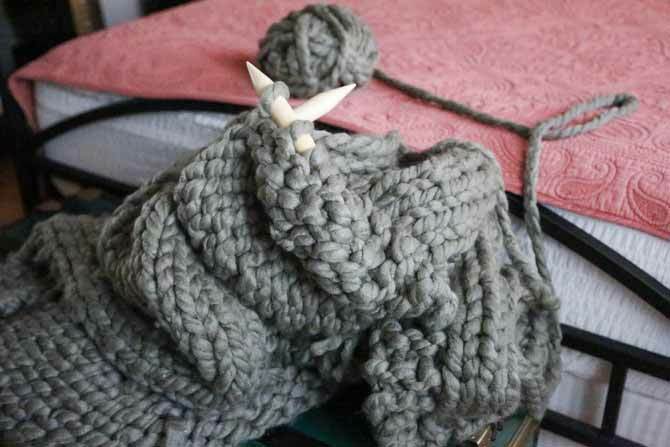 The knitted rows are still manageable and easy to maneuver. For this blanket I used 52 stitches. It took me 1 hour to knit roughly 4 row, which equaled 1 ball. From this perspective, one could finish this very big blanket in one day as it would take 14 hours. It would work up more comfortably in 2 days, but really…what’s the rush? This is August. The knitting becomes a little more tedious towards the end, say the last 3 balls, where this 5’ x 6’ blanket becomes heavy to maneuver in my usual ‘sitting on my couch knitting’ position. So, I knit the last 3 balls while standing, placing the blanket on an ottoman or sitting on the floor with the blanket sprawled. This made it much easier to knit. 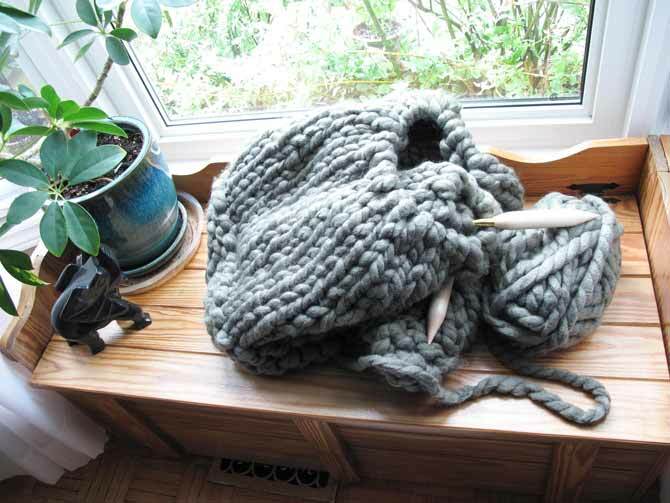 You’re not going to have this issue when knitting a cowl, a throw, or a vest, as these smaller items are still light to hold on to and knit at the same time. I’m knitting a bigger blanket here, and while this sounds cumbersome, it’s still very doable. I love the texture and softness of this blanket! My daughter will be so warm this winter. 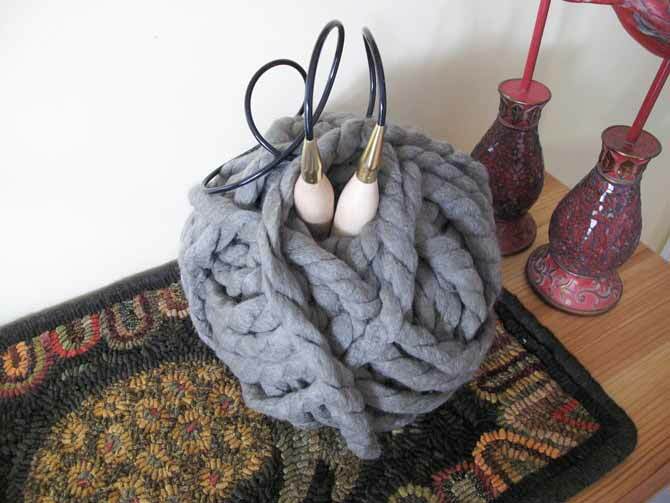 Look how little the 330ml cup looks together with the ball of Irresistible yarn! My daughter’s blanket is very soft and textured at the same time. I placed a cup of 11oz to show you how big the ball of yarn is, and how big the knit is too. Another thing to consider is where to store this project while in progress? Lucky for me, I’ve had this basket laying around forever in our storage room that I never gave away. I always had this sensation I would need it one day! If this isn’t serendipity, I don’t know what is! Look how huge this basket is! It measures 23” in diameter and 9” high is the side. I placed a lap quilt in it to make sure the yarn wouldn’t get caught. You can also place it in a plastic bin, or simply store it in a spare room. 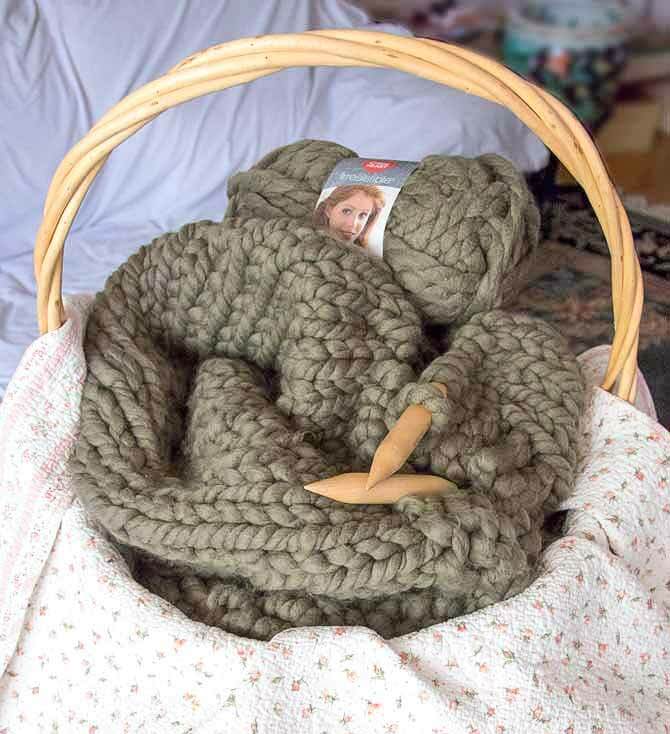 Use a very big basket or a bin to store your jumbo knit project in progress…or leave it in a spare room. The blanket is very soft and textured at the same time. With this all being said about the size and everything, I’m not about to wash it by hand. Smaller items can be washed by hand in a laundry tub/sink. But I’ll send this blanket to the cleaners. This is what the label says about care: hand wash, lay flat to dry, do not iron, do not bleach, dry clean using P solvents. Sounds good to me! What’s the best time of year to knit with Irresistible yarn? Well, that depends. I’m not one to knit according to the weather: I say any time of the year is a great time to knit something up with Irresistible yarn! I knit this blanket in the middle of summer, and the heat didn’t bother me. If it bothers you, then knit it when it’s cooler. You can also take breaks – knit 1 ball every other day, which equals 1 ball per hour — less if you knit faster! Really it’s up to you, but it is a quick knit! 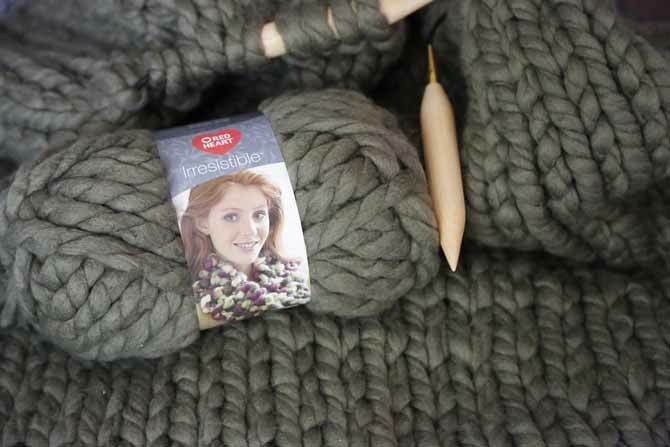 Irresistible yarn in Taupe. When you remove the label the oblong ball takes the shape of a round ball. Join me tomorrow, when I’ll show you the one tip about casting off and weaving in ends in this jumbo project. When I discovered it I was greatly surprised!